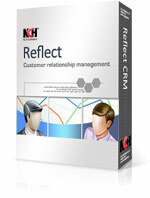 Reflect CRM Software for both Mac and Windows enables a business to easily manage customer relationships and databases. In addition, improve client relationships by taking notes, tracking interactions, tasks and upcoming events. Get it Free. A free version of Reflect CRM software is available for non-commercial use. If you will be using Reflect for your home office you can download the free version here. Easy invoicing software to manage quotes, orders, invoices and track your billing.